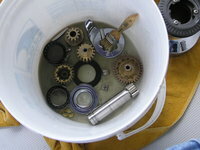 9 - all the parts in the bucket: I put about two inches of solvent in the bucket I used. 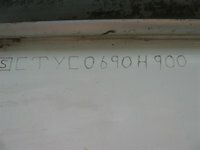 I used the brush to clean all the parts of old grease. 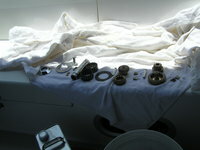 8 - after all parts removed: Wipe up the excess grease from the last time this was serviced. 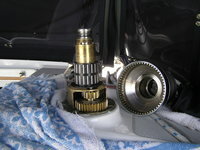 5 - after removal of the bearings: There are two sets of gears that are held in by pins. 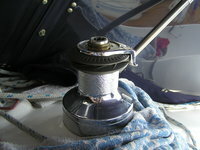 4 - lift off the drum: Lift the drum slowly. 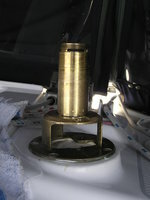 The bearings that are on the shaft sometimes stick in the drum. 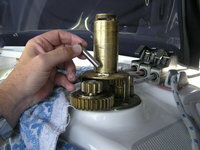 3 - remove the collet pins: They must be removed to lift off the winch peen drum. 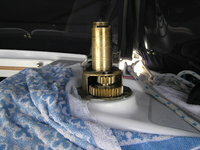 When you replace the drum, these must be removed or the drum will not fit flush. 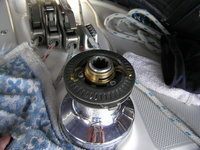 2 - remove the feeder arm: Lift the feeder arm off the shaft. 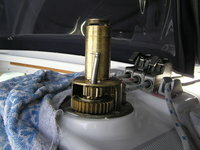 1 - remove the cap: Use a screwdriver and a cloth to prevent scratching. 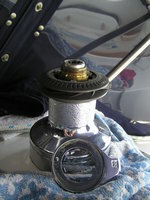 Place the cloth over the cap, tap the notch on the cap with a flathead screwdriver, and unscrew the cap.